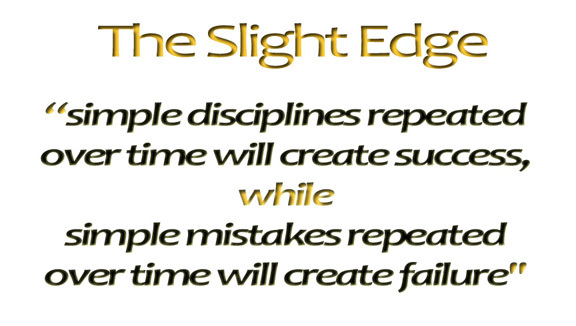 The slight edge is about doing simple things consistently over time. I’m completely sold on the idea of leadership seminars, as I go to them all the time, but I don’t believe one can make a difference; unless that one gets you to start applying the slight edge in your life. The reason one seminar or one book alone won’t make a big difference in your life, is because of how our minds work. You’ll get fired up and might believe you can take over the world, but our minds will naturally tend to drift back towards negativity because that is what is prevalent in the world today. The news is almost all negative, so are most work environments. Without steady doses of the right information, we will quickly go back to who we were before the seminar or book. What if you went to these once a month? What if you read a book on leadership or personal development for just 15 minutes a day for a year? What if that changed your philosophy on life, your worldview? 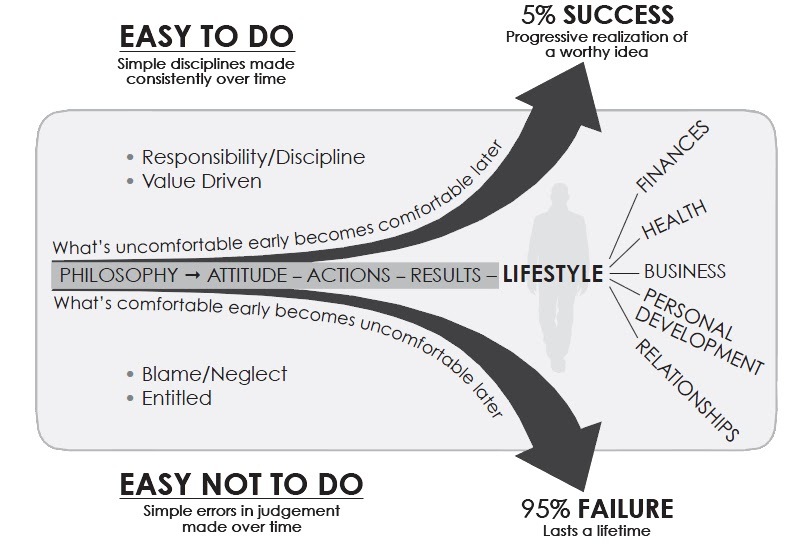 Jeff Olsen has a diagram in his book, demonstrating how ultimately it’s our philosophy that determines our lifestyle. Our lifestyle depends on our results, which stem from our actions, which is influenced by our attitude, which we develop from our philosophy – from how we think. The slight edge is a philosophy that can either bring you to an amazing lifestyle, or a very dismal one, depending on how you apply it. Consider it in your physical health. If you exercise just 15 minutes a day, every day, you can get in pretty good shape after a whole year. Now consider what would happen if you didn’t do anything at all, but sit on the couch all day watching TV; think of how you would look in this scenario. How about the difference over 5 years? If you apply this to your own personal development and read just 10 pages a day, or listen to a good CD on leadership for 15 minutes a day, what do you think the results might be? You would have 15 – 20 great books in your repertoire; the knowledge of highly successful people which if you apply will bring you similar results. It’s very simple to do. But as Jeff Olson points out, most people won’t do it because it’s also easy not to do it. This is because you see no immediate harm in not doing it, just as you see no immediate harm in eating that doughnut. Add this to the fact that not doing is more comfortable than doing it and it’s easy to see why only 5% of the population is considered to be very successful. The key point seems to center around time. It is easy to think the slight edge is not working and give up since we only see the results, good or bad, years later. If we read for 15 minutes a day from a book that will improve our lives, the compounded effect will bring extraordinary results in our future. Think of the idea of a penny doubling every day for a month. You start with 1 penny on day one, which grows to 2 on day 2, then 4, then 8,etc… After 2 weeks you only have $81.92 – which is nothing. Go another week and you have barely $10000. But on day 30 you will have over $5 million. Now apply that principle to personal growth, knowing that you will not notice much at first, but the results will come pouring in a few years later. One important point you get from the book is in regards to finding something you can be successful at. You may love what you’re doing for a career, but is it giving you the results you want? What is success for you? If you don’t actually do something to become successful, you will be unsuccessful your whole life. This is one of the big reasons why I chose to involve myself with Life Leadership. Through its program of leadership and personal development, I can grow personally. On top of that, by helping others grow from its great information, I can achieve the lifestyle I’ve always wanted! Success in any one of these areas begins to affect all the others too. Improve your health and you improve your relationships; work on your personal development and you have an impact on your career. Everything affects everything else. In the end, it all comes back to personal development and getting the right information, as Olson points out quite well. The greatest gift you could ever give yourself is also the wisest business investment you could ever make. It is also the most critical step in accomplishing any challenging task, and is the one step without which all other success strategies, no matter how brilliant or time tested, are doomed to fail. What is this mysterious gift? It is your own personal development. Ben Franklin basically said the same thing; in a shortened version. I love this quote so much that it’s the signature to all my emails. 95% of people don’t succeed as they would like to in their life, and that is mainly because they focus too much on results. Focusing on results is important, as I point out in my page on my goals. But the people who have the drive to succeed yet remain in that 95% category usually ignore what is going to get them the results. It’s going to take the right information; the right philosophy. Olson goes through the different ways of acquiring the right information like books and CDs, but he also covers one more important medium. This is about having mentors and being part of a group or community to support you. It’s easy to quit something, or not do something you should be doing, if no one is watching. When you’re around a group of people it’s harder not to do those easy things that everyone else around you is doing. It’s about the power of association. Robert Kiyosaki points out that your income level will probably be the average of the 5 people you hang around with most. Jeff Olson points out how this principle works for everything, not just money. I was just at a LIFE meeting with Mike Rocheleau speaking, and he made the following great analogy which I feel fits nicely with this subject. If someone backed up a dump truck onto your lawn and emptied its contents all over the place, you would be out of your house and letting the person know how unhappy you were with the situation and would make sure it was cleaned up. But we let garbage into our mind all the time, and welcome it. It’s time to make the decision to do something about it. Stop letting the garbage in, and start putting in pieces of gold instead. Start by reading the Slight Edge! Yes! Success is THAT simple… and THAT hard. Or redefine success. Success is whatever’s working right now. So you’re successful. So you don’t have to worry about trying any more? I think everyone needs to define what success is to them. I don’t believe we should ever stop trying to be better, but you have to know what your goals are. The moment we stop trying is the moment we start going backwards. I find many people define success to be wherever they are at, so they have the excuse to not put in any effort to change. However, if someone takes that root, I really hope they have everything they want out of life, because it will never get better. I agree it’s so important to have clearly defined VALUES ahead of time. This helps prevent running after useless short-term fixes or getting caught up in plans or with people you don’t agree with because by deciding ahead of time what is important to you and what is not, a lot of decisions are already made for you!! It clears out a lot of clutter and mixed signals in your life. For exams if you value education and you could work this weekend for some extra dough but miss a class, well then easy answer! You wouldn’t miss class because you know where you Stan ahead of time! Also clearly define what success is to yourself. Is it truly X amount of income or is success having well-rounded children, etc??? ?